And to think that Attorney General Eric Holder is getting testy about congressional calls for his resignation. After all, the Justice Department has nothing to hide, right? : The Obama Administration has abruptly sealed court records containing alarming details of how Mexican drug smugglers murdered a U.S. Border patrol agent with a gun connected to a failed federal experiment that allowed firearms to be smuggled into Mexico. This means information will now be kept from the public as well as the media. Could this be a cover-up on the part of the “most transparent” administration in history? 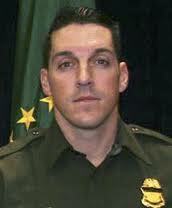 After all, the rifle used to kill the federal agent (Brian Terry) last December in Arizona’s Peck Canyon was part of the now infamous Operation Fast and Furious. Conducted by the Bureau of Alcohol, Tobacco, Firearms and Explosives (ATF), the disastrous scheme allowed guns to be smuggled into Mexico so they could eventually be traced to drug cartels. Link via Judicial Watch. The murder of a U.S. Border Patrol agent is related to the Justice Department willingly turning over thousands of guns to Mexican criminal gangs, and Obama administration is hiding information about his death from the public. Amazing.